POMPEII – Italian archaeologists have uncovered an inscription in Pompeii that suggests the recorded date of Mount Vesuvius’ eruption is months too early. New excavations of the city have brought to light a charcoal inscription on a wall, which archaeologists suggest could be evidence of a different eruption date. 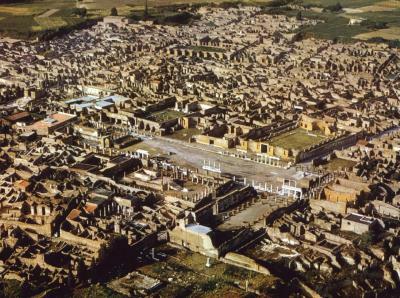 The team working at Pompeii said in a statement, “since it was done in fragile and evanescent charcoal, which could not have been able to last long, it is highly probable that it can be dated to the October of 79 AD.” The consensus among the team now is that the eruption most likely took place on Oct. 24, 79 AD. Until now, it had been widely accepted that the eruption took place on Aug. 24, 79 AD, destroying Pompeii. Historical documents had seemed to provide this date with a fair degree of certainty, yet the new discovery has now brought it into question. An account from Pliny the Younger, a lawyer, author and academic from ancient Rome, included the date Aug. 24. His version of events was recorded in a letter to Roman historian Tacitus, in which he recounted watching the destruction of Pompeii from his home in Miseno, while his uncle, Pliny the Elder, travelled across the bay to help in the rescue attempt. In response to the findings, Italy’s minister for culture, Alberto Bonisoli, was effusive in his praise of the “extraordinary discovery”. “The new excavations demonstrate the exceptional skill of our country,” he said. In addition to the crucial inscription, the latest excavation has revealed a number of impressive houses, each containing complex mosaics and frescoes.